The important herb “bay leaf” is the leaf of an evergreen tree of the laurel family. While a mature bay tree planted in the ground in a hospitable environment (which we do not have, as they can’t take cold winters) can reach 40 or even 50 feet in height, the plant famously accepts container growth well. Bay is normally purchased as a young tree, 1 to (if you’re lucky) as much as 2 feet high. Named cultivars of bay laurel do exist, including “Aurea” (yellowish young foliage); “Angustifolia”, also called “Willow-Leaf bay” (narrow lance-shaped leaves); and “Undulata” (wavy leaf margins). The descriptions do not imply any culinary differences, nor even any real growth differences. 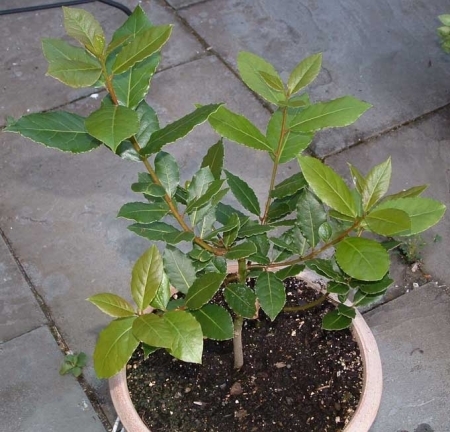 At least one seed house (Nichols) does offer by name a Willow Bay, presumably Laurus nobilis Angustifolia, which they say is especially suitable for container growing and which is what we would recommend (they’re reputable herb specialists). Above all else, when buying a “bay tree” be sure that what you are buying is true Laurus nobilis, not the so-called “California Bay”, a completely different (and culinarily useless) thing. Bay prefers a moisture-retentive, well-drained fertile soil. Your initial bay will likely be pretty small, but give it a generous—nay, huge—pot to grow into. Watering advice is variable: a northern-State university says “Water when dry. Bay laurel thrives with frequent watering.” Yet others caution one to water sparingly. We suspect that it wants more moisture when young than when old, and more in the summer than the winter. In the winter, its location should not be particularly warm, though it does still need some sun. Older trees may like a springtime mulching of leafmold, and pot-grown trees should get occasional fertilizing with “complete” fertilizers (those that contain the so-called “minor” nutrients). The bay is slow-growing. Over the years, it can be pruned to a shape to fit your taste and available space, though untrained trees (bushes, really, when in a pot) are fine; pruning is best done in high summer. Bay trees tolerate fairly heavy pruning without harm, but are slow to grow back. No source we saw seems to discuss this much, but we guess that the size a container-grown bay tree will reach is in part set by the pot itself; several sources refer to pruning their bays to balls about 3 to 4 feet in diameter, which would call for a pretty good-size container (it is a tree, after all). A flowering bay tree produces not only leaves but a fruit, which is less-known and less-used as a flavoring, but interesting. It has what one source calls a “robust” taste, best used in strongly flavored dishes (it reportedly combines well with juniper berries), though some apparently like it for itself (as on potatoes, for instance). Bay trees are notably susceptible to “scale”, of which the typical first symptom is a sticky substance on the leaves. That substance washes off easily with a damp cloth, but it’s a sign of scale insects in the ribs of the leaves and on the stems. They come off easily enough with your finger nail or, for the squeamish, something like. You loaded this page on Friday, 19 April 2019, at 17:12 EDT. It was last modified on Monday, 4 February 2019, at 01:42 EST.